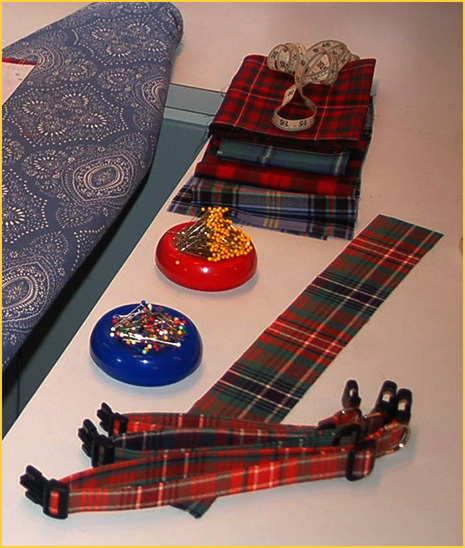 We have access to over 500 authentic Scottish and Irish tartans. The 30 tartan swatches shown below are the favorites of our Heelan’ Hound customers. However, if your family tartan is not shown, ask us if it is possible to Special Order for you. Measure around your dog’s neck where collar fits. Then add the width of two fingers so that the collar will not be too tight. It is the owner’s responsibility to provide The Heelan’ Hound with accurate measurements of their dog. If you have questions on how to measure please call us. We will be happy to talk you through the process. Please remember that these are digital images of authentic tartans. The actual colors may vary slightly from what you see. Sometimes dark blues and greens may appear black. There are also color variations between the modern and ancient versions of the same tartan. If you have any questions as to the exact colors in a particular tartan, please contact us.